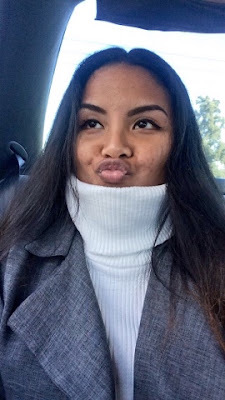 This year, I designed a coat and a turtle neck to go along with it. 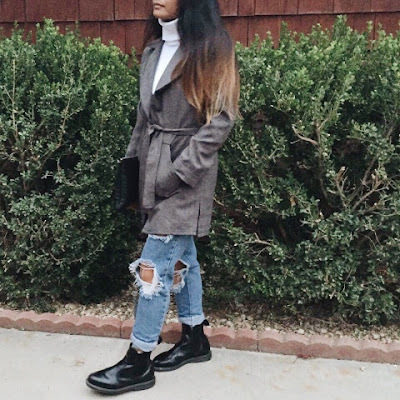 I styled them along with some high waist pants that I thrifted and cut up myself, my favorite black Doc Marten Chelsea boots, and an embossed clutch from Forever 21. Overall, a very chic and comfortable outfit, especially since it was pretty cold! Now for the pieces...lets begin! I made all the patterns from scratch for the both of them. 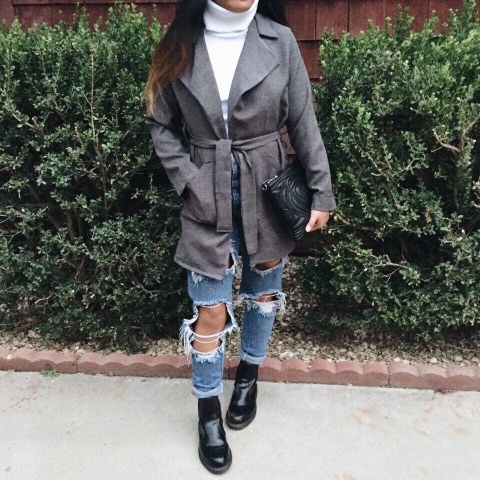 Trench coats have been trending, and they are a must have for the fall/winter season! Since I didn't have time to go to the fabric store to get some wool fabric that I wanted to work with, I decided to use this cotton/polyester fabric that I had laying around. I love the color of the fabric and you can see it has some detailing into it. I also didn't have time to get some zippers (wow, I guess I'm lazy?) so I just added a belt to the waist that you can tie. I also added some pockets, because clothes are instantly 10x better, you feel me? Here are more details of the notched lapel front. Side slit detaling at the bottom of the coat. Back view! As you can see, I added belt hoops on the sides as well. Not much design to this piece, only because I decided to make it the day of Thanksgiving to complement the coat and I completed this in an hour. I bought this fabric at FIDM's Scholarship store, which has amazing deals! I definitely recommend that place if you're ever in the LA area.